Typical Student Things I have never done! I read copious amounts of student blogs and books before going to university about what the experience would be like. I came with a lot of expectations, did these all happen? The short answer, no. I think that I don't really fit the 'typical uni student' stereotype, especially now that I am in second year and need to knuckle down a little bit more. 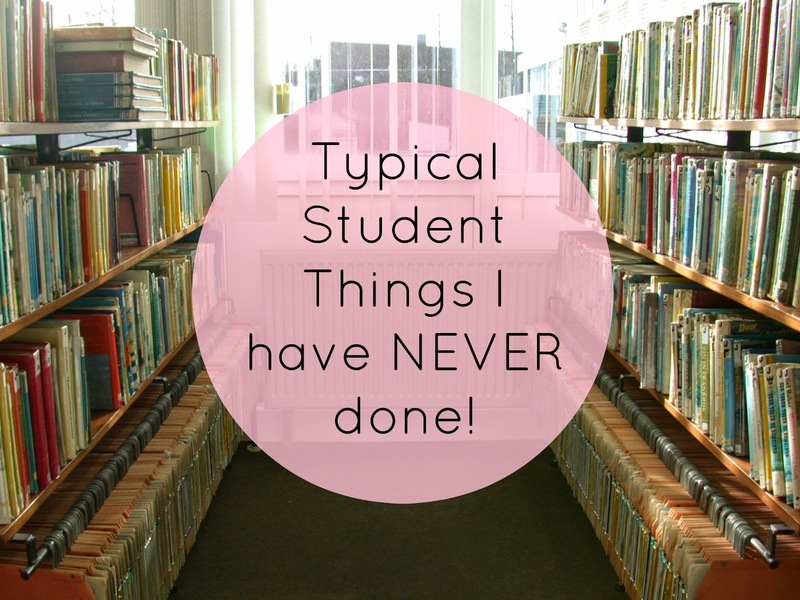 I was reading Jennifer from Ginevrella's post on the typical student things that she has never done and I thought it was great and wanted to do my own! So here are some of the things that, in a year and a half of university, have never done. I like my sleep too much to do this one. I am happy to say that so far I have never left so much work to do that I have to do this, and I had many flatmates that would! I think it is always better to sleep and try again in the morning! I have never thrown up due to alcohol consumption. Admittedly I don't drink a huge amount, but still I was always the lowest on the 'chunder chart'. People think that all students eat/can afford is baked beans. Honestly, I hate baked beans, so none for me thank you! Does anyone else get asked this all the time?! I lived in a mixed halls first year, and apparently it is the thing that happens, especially in freshers week? Well this definitely didn't happen. I actually did most of Freshers week sober, and I didn't go out every night either. It really wasn't my cup of tea, or my favourite way to get to know people! What are some of the typical student things that you haven't done? What a fab post! And so refreshing to see students not just using uni as a party. I know many people on both sides but am glad to say I was neither as I didnt go at all! I actually had a Zoology graduate friend write a guest post on my blog about life as a 'proper' student as it was peeing me off how many people I saw wasting their time and money. I actually know someone who spent their student loan on a holiday to New York! 2, 5 and 6 I never did either. I missed a fair few lectures because I was asleep. Or had a nap in them.